Walking football is a very popular game in the UK - trouble is, no-one can agree how to play it. There are 800 clubs playing a sport invented in 2011 as a low-impact alternative to the 'beautiful game'. But with no standardised rules, except that running is forbidden, disputes have become common at competitions nationwide. Now the Football Association is stepping in, drafting a rulebook that it hopes everyone can agree on. Andy Dyke, the FA's national participation manager for recreational football, said the association wanted to encourage serious, competitive walking football and was working with groups involved in the sport to create a standard set of rules. "The challenge is to retain its appeal as an accessible, fun, recreational pastime, but add a formal element for those that seek to take the game to a more competitive level," he said. "We recognise the importance of putting the players themselves at the heart of any decision and are currently involved in a series of consultations". The rulebook is likely to follow the FA's existing rules for small-sided matches. Walking football is usually played between teams of five to seven players, with kick-ins instead of throw-ins, no offside rule and, of course, a slower pace. 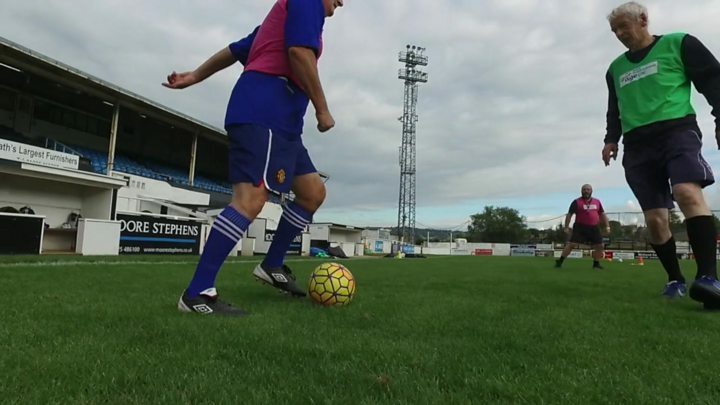 Steve Rich, who runs a national directory of walking football clubs, said: "People who've got too old or injured have to leave regular football in their 30s. Walking football is a way to extend their football career without the pace and twisting and turning of the faster game. "But it's immensely good exercise - we see people lose weight and gain condition." Mr Rich, who took up walking football after a knee injury when he was 26, said the sport had grown from 125 clubs two years ago to 800 clubs today. But he said it was held back by a lack of an agreed rulebook. "One team down the road or in a different county may have completely different rules. It's great that the FA has finally decided to step in. It's got to the stage where some people are deciding to leave competitive walking football because of the various rules," he said. One of the most controversial issues in dispute is the level of physical contact allowed between players, said Mr Rich, with some clubs insisting on minimal contact and others allowing a more physical game. But clubs agree on the way to enforce a walking pace - players are required to keep one foot on the ground at all times. Anyone who breaks into a jog usually receives two warnings before a two-minute penalty in the sin bin. The game was initially created by Chesterfield FC Community Trust in 2011 as a way to help older players and people with injuries stay active. It has since won the endorsement of players such as Sir Geoff Hurst and Harry Kane, who took part in a promotional match last year.